Learn how to make React and Redux control a bunch of SVG elements to create a game. 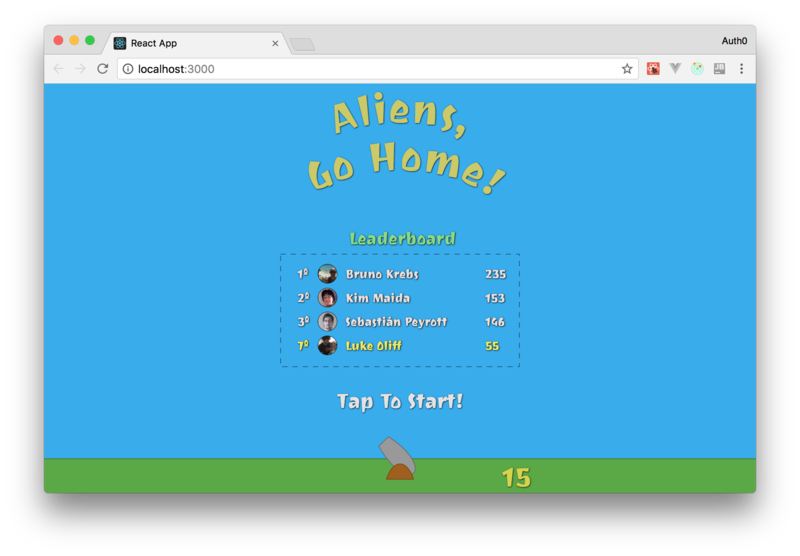 The React Game: Aliens, Go Home! The game that you will develop in this series is called Aliens, Go Home! The idea of this game is simple, you will have a cannon and will have to kill flying objects that are trying to invade the Earth. 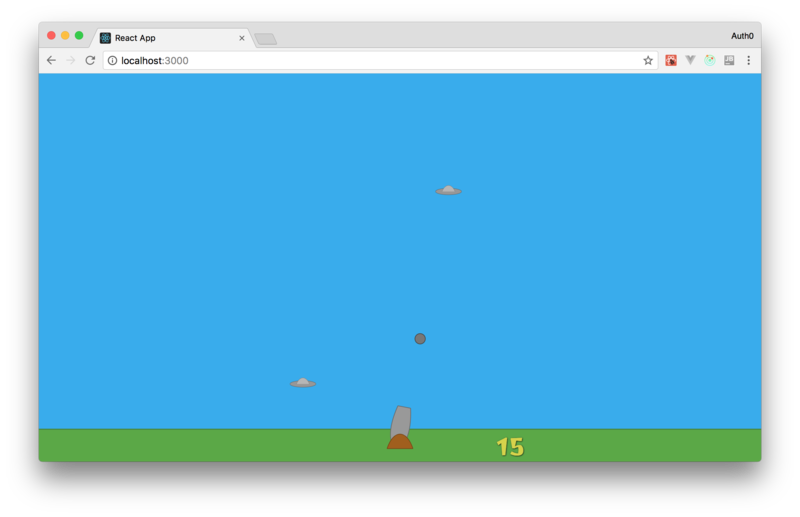 To kill these flying objects you will have to point and click on an SVG canvas to make your cannon shoot. If you are curious, you can find the final game up and running here. But don't play too much, you have work to do! "I'm creating a game with React, Redux, and SVG elements." These actions paved the way to understand how you can create your game (and other animations) with React, Redux, and SVG. In the second part, you have created the other elements needed in your game (e.g. Heart, FlyingObject, and CannonBall), enabled your players to start the game, and used CSS animations to make flying objects fly (that's what they do right?). Although these are awesome features to have, they don't make a complete game yet. You still have to make your cannon shoot cannon balls and implement an algorithm to detect collision between these balls and flying objects. Besides that, you have to increment the CurrentScore component when your players kill some aliens. Killing aliens and seeing the current score increase is cool, but you probably can make this game more attractive. That's why you are going to add a leaderboard feature to your game. This will make your players spend more time trying to reach the top of the leaderboard. With these features, you can say that you have a complete game. So, without wasting more time, it's time to focus on them. Note: If (for whatever reason) you don't have the code created in the first two parts of the series, you can simply clone it from this GitHub repository. After cloning it, you will be able to follow the instructions in the sections that follow. The first thing you will do to make your game look like a real game is to implement the leaderboard feature. This feature will enable players to sign in, so your game can track their max score and show their rank. To make Auth0 manage the identity of your players, you have to have an Auth0 account. If you don't have one yet, you can sign up for a free Auth0 account here. After creating your account, you just have to create an Auth0 Application to represent your game. To do this, head to the Applications page on the Auth0 dashboard and click on the Create Application button. The dashboard will show you a form where you will have to inform the name of your application and its type. You can type Aliens, Go Home! as the name and choose the Single Page Web Application type (your game is an SPA based on React after all). Then, you can click on Create. When you click this button, the dashboard will redirect you to the Quick Start tab of your new application. As you will learn how to integrate React and Auth0 in this article, you won't need to use this tab. Instead, you will need to use the Settings tab, so head to it. There are three things that you will need to do in this tab. The first one is to add the http://localhost:3000 value to the field called Allowed Callback URLs. As the dashboard explains, after the player authenticates, Auth0 will only call back one of the URLs in this field. So, if you are going to publish your game on the web, be sure to add its public URL there as well (e.g. http://aliens-go-home.digituz.com.br). After inputting all your URLs on this field, hit the Save button or press ctrl + s (if you are using a MacBook, you will need to press command + s instead). The last two things you will need to do is to copy the values from the Domain and Client ID fields. However, before using these values, you will need to code a little. As you will see, this package facilitates the integration between Auth0 and SPAs. As you can see, in this new version, you have imported the Login component and the signIn function of the auth0-web package. Then, you have added your new component to the block of code that is shown only if players have not started the game. Also, you have indicated that, when clicked, the login button must trigger the signIn function. Note: You have to replace YOUR_AUTH0_DOMAIN and YOUR_AUTH0_CLIENT_ID with the values copied from the Domain and Client ID fields of your Auth0 application. Besides that, when publishing your game to the web, you will have to replace the redirectUri value as well. configure: You used this function to configure the auth0-web package with your Auth0 application properties. handleAuthCallback: You triggered this function in the componentDidMount lifecycle hook to evaluate if the player is returning from Auth0 after authenticating. This function simply tries to fetch tokens from the URL and, if it succeeds, fetches the player profile and persists everything in the localstorage. subscribe: You used this function to log if the player is authenticated or not (true for authenticated and false otherwise). That's it, your game is already using Auth0 as its identity management service. If you run your app now (npm start) and head to it in your browser (http://localhost:3000), you will see the login button. Clicking on it will redirect you to the Auth0 login page where you will be able to sign in. After you finish the sign in process, Auth0 will redirect you to your game again where the handleAuthCallback function will fetch your tokens. Then, as you have told your app to console.log any changes on the authentication state, you will be able to see it logging true in your browser console. "Securing games with Auth0 is simple and painless." Now that you have configured Auth0 as your identity management system, you will need to create the components that will show the leaderboard and the max score for the current player. For that, you will create two components: Leaderboard and Rank. You will need to split this feature into two components because, as you will see, it's not that simple to show player's data (like max score, name, position, and picture) in a nice way. It's not hard either, but you will have to type some good amount of code. So, adding everything into one component would make it look clumsy. currentPlayer: This defines who the current player is. For now, you are using one of the fake players defined before so you can see how everything works. The purpose of passing this parameter is to make your leaderboard highlight the current player. authenticate: This is the same parameter that you were adding to the Login component in the previous version. leaderboard: This is the array of fake players. Your leaderboard will use it to show the current ranking. You are defining the leaderboardTitle constant to set how the leaderboard title will look like. You are defining the dashedRectangle constant to style a rect element that will work as the container of the leaderboard. You are calling the sort function of the props.leaderboard variable to order the ranking. After that, your leaderboard will have the highest max score on the top and the lowest max score on the bottom. Also, if there is a tie between two players, you are ordering them based on their names. You are calling the map function on the result of the previous step (the sort function) to complement players with their rank and with a flag called currentPlayer. You will use this flag to highlight the row where the current player appears. You are using the filter function on the result of the previous step (the map function) to remove everyone who is not among the top three players. Actually, you are letting the current player stay on the final array if they don't belong to this select group. Lastly, you are simply iterating over the filtered array to show Rank elements if there is a player logged in (props.currentPlayer && leaderboard.map) or showing the Login button otherwise. Nothing to be scared of about this code either. The only unordinary thing that you are adding to this component is the clipPath element and a rect inside the defs element to create a rounded portrait. With these new files in place, you can head to your app (http://localhost:3000/) to see your new leaderboard feature. Cool, you are already using Auth0 as the identity management service and you also created the components needed to show the leaderboard. So, what do you need next? That's right, you need a backend capable of emitting real-time events to update the leaderboard. This may make you think: isn't it hard to develop a real-time backend server? No, it is not. With Socket.IO, you can develop this feature in no time. However, before diving into it, you will probably want to secure this backend service, right? To do this, you will need to create an Auth0 API to represent your service. The Name of the API: Here, you need to inform just a friendly name so you don't forget what this API represents. So, just type Aliens, Go Home! for this field. The Identifier of the API: The recommended value here is the final URL of your game, but the truth is that it can be anything. Nevertheless, insert https://aliens-go-home.digituz.com.br in this field. The Signing Algorithm: There are two options here, RS256 and HS256. You will be better off leaving this field untouched (i.e. stick with RS256). If you want to learn the difference between them, check this answer. After filling this form, click on the Create button. This will redirect you to a tab called Quick Start inside your new API. From there, click on the Scopes tab and add a new scope called manage:points with the following description: "Read and write Max Score". It's a good practice to define scopes on Auth0 APIs. Before learning about what this code does, replace YOUR_AUTH0_DOMAIN with your Auth0 domain (the same one that you added to the App.js file). You will find this placeholder in the value of the jwksUri property. express and socket.io: This is simply an Express server enhanced with Socket.IO to make it real-time. If you haven't used Socket.IO before, checkout their Get Started tutorial. It's really simple. jwt and jwksClient: When authenticating with Auth0, your players will get (among other things) an access_token in the form of a JWT (JSON Web Token). Since you are using the RS256 signing algorithm, you need to use the jwksClient package to fetch the correct public key to validate JWTs. The JWTs that you receive contain a kid property (Key ID) that you can use to get the correct public key (if curious, you can learn more about JWKS here). jwt.verify: After finding the correct key, you use this function to decode and validate JWTs. If they are fine, you just send the players list to whoever is requesting. If they are not valid, you just disconnect the socket (client). on('new-max-score', ...): Lastly, you are attaching the newMaxScoreHandler function to the new-max-score event. As such, whenever you need to update the max score of a user, you will need to emit this event from your React app. The rest of the code is pretty intuitive. Therefore, you can focus on integrating this service into your game. LOGGED_IN: When a player logs in, you will use this action to connect your React game to the real-time service. LEADERBOARD_LOADED: When the real-time service sends the list of players, you will use this action to update the Redux store with these players. Now, whenever your game triggers the LEADERBOARD_LOADED action, you will update the Redux store with the new array of players. Besides that, whenever a player logs in (LOGGED_IN), you will update the currentPlayer in the store. Then, as your game is not complete and your players cannot kill aliens yet, you added some temporary code to simulate new-max-score events. First, you emitted a new maxScore of 120, which puts the logged-in player in the fifth position. Then, after five seconds (setTimeout(..., 5000)), you emitted a new action with a new maxScore of 222, putting the logged-in player in the second position. // REMOVE the leaderboard constant !!!! Remove the leaderboard constant. Now, you are loading this constant from your real-time service. Update the <Leaderboard /> element. You have some more realistic data now: props.currentPlayer and props.players. Enhance the propTypes definition to declare that the Canvas component can use the currentPlayer and players value. Then, open your game in your browser (http://localhost:3000). There, you will see that, after logging in, you will appear in the fifth position and that, after 5 seconds, you will jump to the second position. Shooting Cannon Balls: To kill aliens, you must allow your players to shoot cannon balls. Detecting Collisions: As your game will have cannon balls and flying objects moving around, you must implement an algorithm to detect collisions between these object. Updating Lives and the Current Score: After allowing your players to kill flying objects, your game must increment their current score so they can achieve new max scores. Also, you need to decrement lives when flying objects invade the Earth. Updating the Leaderboard: With all the features above implemented, the last thing you will have to do is to update the leaderboard with new max scores. So, in the next sections, you will focus on implementing these pieces to wrap up your game. To allow your players to shoot cannon balls, you will add an onClick event listener to your Canvas. Then, when clicked, your canvas will trigger a Redux action to add a cannon ball to the Redux store (that is, to the state of your game). The movement of this ball will be handled by the moveObjects reducer. This function starts by checking if the game is started or not. If it is not, it simply returns the current state. Otherwise, it checks if the game already contains two cannon balls. You are limiting the number of cannon balls to make the game a little bit harder. If the player has shot less than two cannon balls, this function uses calculateAngle to define the trajectory of the new cannon ball. Then, in the end, this function creates a new object representing the cannon ball and returns a new state to the Redux store. Note: It is important to add cannonBalls.map before CannonPipe because, otherwise, cannon balls would overlap the cannon itself. These changes are enough to make your game add cannon balls to their initial position (x: 0, y: 0) and with their trajectory (angle) properly defined. The problem now is that these objects are inanimate (that is, they don't move). Note: To learn how the formula above works, take a look here. In the function exposed by this file, you are doing two important things. First, you are using the filter function to remove cannonBalls that are not within a specific area. That is, you are removing cannon balls that are above -800 on the Y-axis, or that moved too much to the left (lower than -500) or to the right (greater than 500). In the new version of this file, you are simply enhancing the previously moveObjects reducer to make use of the new moveBalls function. Then, you are using the result of this function to define a new array to the cannonBalls property of the gameState. Now, with all these changes in place, your players will be able to shoot cannon balls. You can check that by testing your game in a web browser. Now that your game supports players shooting cannon balls and that there are flying objects trying to invade the Earth, it is a good time to add an algorithm to detect collisions. With this algorithm, you will be able to remove cannon balls and flying objects that collide. This will also enable you to work on the next feature: Incrementing the Current Score. A good strategy to follow when trying to implement the algorithm that checks collisions is to imagine the cannon balls and flying objects are rectangles. Although this strategy is less precise than implementing an algorithm that considers the real format of these objects, handling them as rectangles will make everything much easier. Besides that, for this game, you won't need too much precision because, fortunately, you won't need this algorithm to kill real aliens. It defines an array called objectsDestroyed to hold everything that is destroyed. It iterates over the flyingDiscs array (with the forEach function) to create a rectangular representation of the flying discs. Note that, as you are using CSS animations to move these objects, you need to calculate their positions over the Y-axis based on their currentLifeTime. It iterates over the cannonBalls array (with the forEach function) to create a rectangular representation of the cannon balls. It calls the checkCollision function with both rectangular representations to decide if these objects must be destroyed. Then, if they must be destroyed, they are added to the objectsDestroyed array that this function returns. Here, you are using the result of the checkCollisions function to remove objects from the cannonBalls and flyingObjects arrays. Now, when cannon balls and flying objects overlap, the new version of the moveObjects reducer will remove them from the gameState. You can see this in action in your web browser. These new lines of code simply compare the current length of the flyingObjects array with the one from the original state to decide if players must loose a life or not. This strategy works because you are adding this code right after popping flying objects that remained for 4 seconds in the game ((now - object.createdAt) < 4000) and before removing objects that collide. So, if the length of these arrays differs, it means one flying object invaded the Earth. With these changes in place, your game is almost complete. Players are already able to shoot and kill flying objects and, if too many of them invade the Earth, the game is ended. Now, to complete this section, you need to update the current score of your players, so they can compete to see who kills more aliens. "I'm creating a game with React, Redux, SVG, and CSS animations." Good news! Updating the leaderboard is the last thing you will have to do to be able to say that you wrote a complete game with React, Redux, SVG, and CSS animations. Also, as you will see, the work here will be quick and painless. You defined two new properties on its class (socket and currentPlayer) so you can use them on different methods. You removed the fake max scores that you were emitting to simulate new-max-score events. You made your code iterate over the players array (the one received from the Socket.IO backend) to set the correct maxScore of your players. That is, if they come back another time, they will still have their maxScore record. You defined the componentWillReceiveProps lifecycle method to check if players have reached a new maxScore. If so, your game emits a new-max-score event to update the leaderboard. Then, open two browsers, authenticate with different email addresses, and kill some aliens. You will see that, when the game is over, the leaderboard will be updated in both browsers. In this series, you used a lot of amazing technologies to create a nice game. You used React to define and control the game elements, you used SVG (instead of HTML) to render these elements, you used Redux to control the state of the game, and you used CSS animations to make aliens move through the screen. Oh, besides that, you even used a little bit of Socket.IO to make your leaderboard real-time and Auth0 to work as the identity management system of your game. Phew! You came a long way and you learned a lot in this three articles. Perhaps it is time to take a break and play your game.